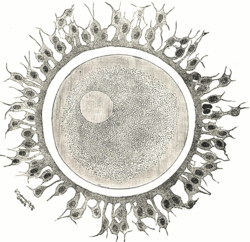 A zygote (frae Greek ζυγωτός zygōtos "joined" or "yoked", from ζυγοῦν zygoun "tae jyn" or "tae yoke"), is a eukaryotic cell formed bi a fertilisation event atween twa gametes. ↑ "English etymology of zygote". myetymology.com. This page wis last eeditit on 21 November 2015, at 02:09.